💡 Note: Make sure to use an HTTPS protocol whenever you put codes into the Lodgify console. Read more. Include your custom codes into the section Code injection. 💡 Note: The code will be injected in the <header> section of the website. Meta Tags, for example, to include the Google site verification code. Header - Custom CSS page styles and design, for example, to amend the shape of buttons. 💡 Note: The code will be injected in the <body> section of the website. 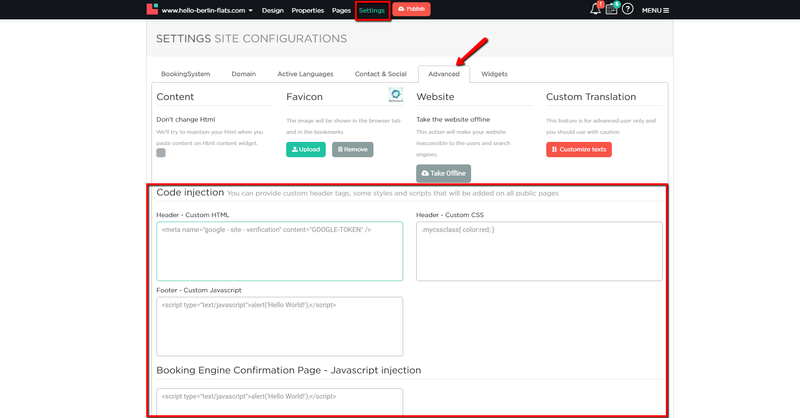 page functionalities, for example, to include your Facebook remarketing pixel or other types of trackers that need to go into the <body> section of the website. 💡 Note: The code will be injected only in the check-out pages of the website. conversion tracking, for example, to include the Google Ads tracking code to track visitors reaching your check-out. 💡 Note: we suggest to use this section only if you have a thorough understanding of programming languages.